Involve. Engage. Motivate. The Supervisor! New hires take a few months to lose interest and motivation. And it is the Supervisor who can bring things back together. Give them some simple training and some tools to deal more effectively with performance, both the coaching of people and the facilitation of ideas. Implementation and ownership are keys to performance improvement. 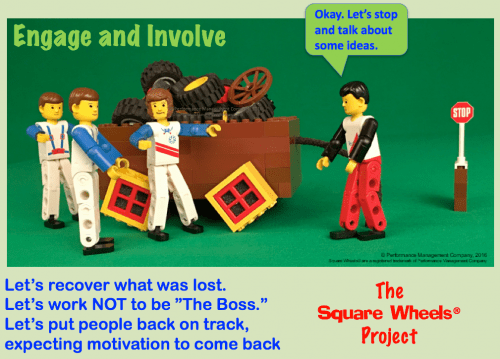 The Square Wheels Project is a simple course on facilitating workplace engagement and involvement, designed for front-line managers. I was shocked and amazed to see, after we have spent billions of dollars on surveys and assessments and trainings of various kinds, that workplace engagement continues to be an issue and that only about a third of people seem to care about their workplaces. It is amazing because there are thousands of books on leadership, amazing quantities of published works on organizational alignment and missions/visions, as well as how-to books like Good to Great and even way back to Managing Excellence-themed works — they all seem to show that the issue of generating shared expectations and teamwork looks pretty straightforward. Just DO It, right?! 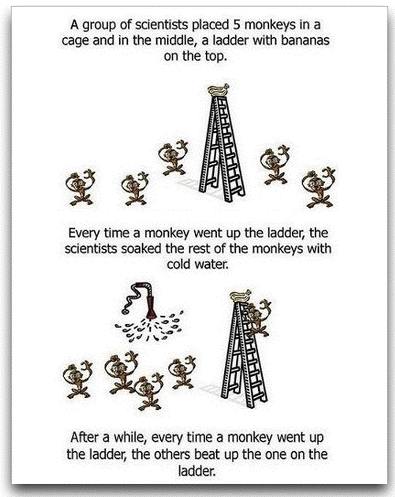 But works such as Lenconi’s “The Trouble with Teams” shows that there are issues. Heck, an old article I read documented the ideas around Theory F, that FEAR was a good tool for managers to use to manage performance. (I mean, yeah it happens but to do it as a conscious strategy around workplace fear seems to be a reach!). Gallup just published a report that showed that only 35% of male managers in the US are engaged in their jobs. Repeating: only 1/3 of males who are managing and leading other people are themselves engaged. (It is better for women – 41%, and it also shows that the teams working under women are also more engaged). Now whether or not the story is accurate, it does reach out to the issue that lots and lots of managers, supervisors and workers don’t seem to know or to care. So what can we do differently? Well, the answer to the engagement issue sure seems to be the involvement narrative. People that are told what to do simply push back; I know it and you know it because we all do it pretty naturally, almost biologically. This is also supported by the idea that nobody ever washes a rental car. Talk to an owner of a rental car franchise to get some amazing war stories of what went out and what returned. Talk to someone who owns rental property. We simply cannot simply expect people who have no ownership to take the same responsibility as the ones who hold some proprietary interest in it. Supervisors should be asking and listening. They should be asking their people for ideas about what needs to be improved to make their workplace more efficient and effective and those ideas should be considered for implementation. A solid approach to facilitation helps clarify the issues and opportunities, identify best practices and good ideas, and would help drive ownership involvement, teamwork and alignment to shared goals and expectations. Is this a Perfect Solution? Probably not, because there is a lot of stuff cascading down from above that impacts motivation and morale and how things are prioritized. But does it make sense at the local level, where the supervisor interacts with the worker? Most certainly. This is the leverage point, but the supervisors generally do not have the skills to manage this and HR and T&T are generally too lean to offer much help. 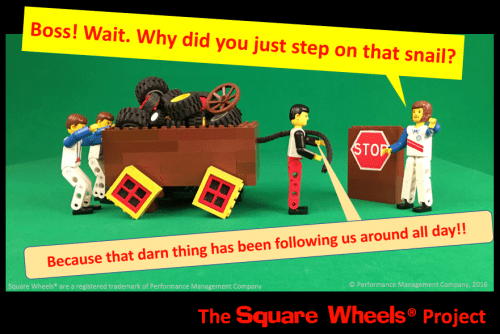 What we are doing with The Square Wheels Project is teaching some simple, straightforward facilitation skills using an image that allows people to share their thoughts and ideas. We are sharing ideas about how to make these meetings highly interactive and effective, and suggesting how to structure the collection of ideas and the development of implementation strategies. And we are setting up a peer-coaching and peer-support approach to help supervisors actually move forward and do some things differently. And we are keeping things very simple and straightforward: Show the image, ask tabletops for reactions and thoughts, identify some operating Square Wheels, select some to work on and generate some Round Wheels solutions. Implement. We are focused on engagement, but we are also driving innovation, intrinsic motivation, teamwork and a lot of other positive team building and team bonding kinds of things. We will also support learners with ideas on managing roadblocks through a similarly engaging process. Engagement Cannot Be Rocket Science. Involving people in workplace improvement ideas simply cannot be as hard as the big consulting firms, looking for the big consulting contracts, would make it appear. Ask, and Ye Shall Receive! If you want to see more, go to www.TheSquareWheelsProject.com to view a short introductory video. Innovation and continuous improvement are increasingly important issues for today’s business, with engagement, motivation and the resulting implementation being among the most critical components of future profitability. But there is also a concept in behavioral psychology called the “post-reinforcement pause” which occurs after a successful event. In quality improvement, we heard about this expressed as, “Yes, we did our continuous improvement initiative.” meaning that it was accomplished and there was no further need to do anything more, that the box was now checked on the annual performance appraisal process. Continuous improvement IS continuous. And the improvements made today, that DO need to be celebrated and recognized and which should be supportive of more efforts tomorrow, often get PAUSED. The incentive to do more slows or stops and we rest on our laurels. There are many things we can choose to do that can have widespread impacts on organizations. My thinking is that by changing the language of performance and innovation, we can change the thinking of people about communicating about issues and opportunities. Remember that the Round Wheels are already IN the wagon. Seriously, For the FUN of It!